The Provencal landscape of farmhouses or mas, vineyards and typical unspoilt villages sets the scene as we pass along avenues of majestic plane trees. 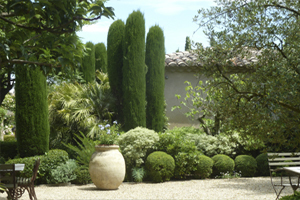 Our visits encompass both traditional farmhouse-style gardens and contemporary, Mediterranean country gardens, some influenced by Nicole de Vesian, modern local landscape architects and the Land Art movement. Most gardens are privately owned. Wild poppies in the cornfields, roses and lavender abound. The craggy limestone Alpilles are a focal point around St Rémy, while the forested Luberon hills have perched hill-top villages. A visit to the Camargue has been added, not to be missed when in the region. We stay for the first few days at Château de Mazan on the edge of the medieval village of Mazan, moving afterwards to the attractive town of St Rémy-de-Provence at the foothills of les Alpilles. Hotel de l’Image has its attractive garden and pool. Train travel available – London to Avignon. 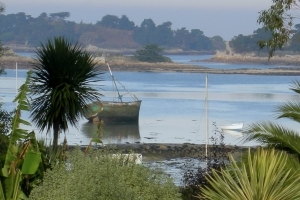 Upper Normandy has a wealth of remarkable gardens on the coast with a mild climate and acid soil. Inland country gardens amongst apple orchards, rolling hills and forests are inspirational. Some contemporary, some walled potager gardens, and all with enthusiastic owners. 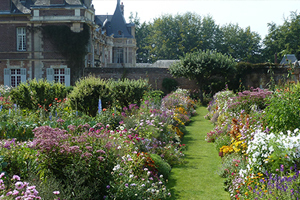 We venture further west to visit two exceptional gardens around Bayeux. All have a rich variety of trees and plants arranged with great panache. The two nurseries visited have excellent collections of plants. On the arrival day we include a visit to Monet’s sumptuous garden at Giverny before our journey to the hotel. Protected to the north by the Alpes Maritimes, and facing the Mediterranean, Menton enjoys a warm, gentle microclimate which encouraged plant collectors in the early twentieth century to create gardens among terraces of olive and citrus trees. With species brought from many parts of the world, these gardens provide a fascinating insight into the influence of Thomas and Daniel Hanbury, the Waterfield family and Lawrence Johnston, all part of a gardening fraternity who exchanged plants and ideas. Our itinerary includes some rarely opened and secluded gardens of exceptional beauty, with superb plant collections. In early October gardens enjoy a second spring. We stay at the very comfortable and welcoming Hotel Napoleon in Garavan bay, overlooking the bay towards the old, perched town of Menton. 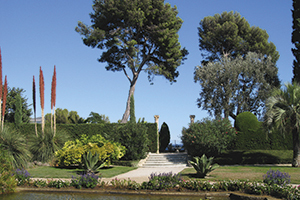 Most gardens visited are within twenty minutes of the hotel. A small comfortable coach is used for the day’s visit to St Jean Cap Ferrat travelling for about one hour.